More than two thousand five hundred years ago, there lived in India, in the shadow of the Himalayas, a tribe called the Sakyas. The chief of the tribe was Raja Shuddho dhana and his queen's name was Mahamaya. Their capital was the beautiful city Kapilavastu. One night, Mahamaya had a strange dream. She dreamt that four kings carried her up to a lovely lake on a silver mountain, where she was bathed, dressed in fine clothes and bedecked with flowers. Then, they took her to a celestial palace and laid her upon a golden bed. A white elephant with a lotus in its trunk approached and after going round her three times struck her side. Learned Brahmins interpreted the dream as a sign that Mahamaya would soon give birth to a great and noble son. And so it came to pass. When Mahamaya knew that she was to become a mother, following the custom, she left for her father's house. While she was still on her way, however, a son was born to her in a grove of Sal trees at Lumbini. Mahamaya now turned back and returned to Kapilavastu. King Shuddhodhana received them enthusiastically and there was great rejoicing in the kingdom. Shortly afterwards mother and child were visited by the sage Asita. Taking the prince, who was hardly a day old, in his arms he exclaimed with joy, "Indeed he will be a Great One!" Then tears began to trickle down Asita's cheek. King Shuddhodhana was immediately filled with alarm. "What danger is going to befall my son?" he asked anxiously. "I am not crying for the child," replied Asita, "but for myself. This child will one day bring deliverance to the world. I am old and will not live to see that day. So I cry." Saying this the sage went his way. The king and queen rejoiced at hearing Asita's words and named their son Siddhartha. Seven days after the baby's birth, Mahamaya died. Prajapati, Mahamaya's sister and Shuddhodhana's second wife, brought him up as her own son. King Shuddhodhana sent for the most learned pandits from far and near and of all of them the king asked, "What is the future of my son?" They all agreed with Asita. "He will indeed be a king of kings. He will be renowned all over the world." "But how?" the Raja wanted to know. "He will conquer the world," said one learned pandit. "Only if he stays at home," added another. "He will be a world famous teacher," said the third. "Only if he renounces the world to become an ascetic," added a fourth. Fame as a teacher did not interest Shuddhodhana. He wanted his only son to follow the Kshatriya tradition and become a world conqueror. "Keep the prince away from all sorrow and suffering if you do not want him to renounce the world," warned the pandits. So Shuddhodhana decided to try and keep his son always happy and only surrounded him with what was beautiful. He built three palaces. One was for summer; it was lined with tall trees for shade which caught the cold breeze. Another was for winter, with open avenues bright with sunlight and warmth. Yet another was for the rainy season with spacious halls for indoor games and sports. All three palaces were surrounded with flower gardens and lotus pools. And the guards were instructed to see that only the healthy and young would enter the palaces. Gautama, because he belonged to the Gautama clan. One day when he was strolling in the palace garden Siddhartha saw a flock of wild swans flying overhead. Just then an arrow whizzed through the air and a bird fell, dying. Sidd hartha ran up to it, gently pulled out the arrow, dressed its wound and tended it. Just then Devadatta arrived and demanded the bird. But Siddhartha refused to part with it. Devadatta complained to Shuddhodhana. "I shot down the bird," he said, "but Siddhartha refuses to give it to me." When Shuddhodhana questioned his son, Siddhartha replied, "I saved the swan's' life, Devadatta tried to destroy it. Shouldn't a life belong to the one who saves it rather than to the one who tries to destroy it?" The force of the argument impressed the king. He let Siddhartha have the bird. As Siddhartha grewup,Shuddhodhana employed the most learned teachers of the land to instruct him. His son was clever and intelligent and quickly learned not only to read and write, but also became proficient in the princely arts such as wrestling, fencing and archery. This kind and gentle boy grew up into a handsome young man. He was popular, considerate and courteous to everyone. At a family gathering he met his, cousin, the beautiful Yashodhara and fell in love with her. According to the custom of the time Yashodhara's father organized an archery contest to select a suitable husband for his daughter. Siddhartha decided to enter the contest and win Yashodhara for his own. But Yashodhara had many suitors. Princes came from far and near to win her hand in marriage. They all seemed big, tough arid strong. Compared to them, Siddhartha not only appeared somewhat delicate but looked dreamy and thoughtful. Everyone dismissed any chance of his winning the competition. But they soon had to change their opinion. As the contest progressed Siddhartha proved equal to the others. Bows were brought, the contestants strung them and shot arrows right through the targets. Then aiming high, they hit distant targets with remarkable accuracy. And so did Siddhartha. Finally Siddharta asked for a bigger and stronger bow. Avery large bow called Simhahanu's bow, was kept in a temple. It was so strong that nobody had been able to string it. A few attendants now ran and brought it to him. As the people looked on expectantly, Siddhartha picked up the bow and strung it with ease. Then he shot an arrow into the air. The arrow vanished beyond the horizon, making a roaring sound. After this the other princes conceded defeat. One by one they all left and Siddhartha was declared the winner. Shuddhodhana was very happy. He was now sure that his son would become a great conqueror and thought that Siddhartha would never renounce the world or leave a wife as beautiful as Yashodhara. Siddhartha lived happily in his palace with his beautiful wife. Shuddhodhana was very careful to always surround him with all that was beautiful and joyful. Siddharatha did not even know that there was sorrow and suffering in the world. However, Siddhartha naturally guessed that there was a world beyond the palace gates and wondered what it was like. He would often wander off on his own, find a secluded place and sit for hours, immersed in thought. One day he expressed the desire to see for himself the world outside. When Shuddhodhana heard of this, he did not object. "Good," said he, "it is time the prince saw his country and the people he will lead one day." Shuddhodhana gave orders that the city should be swept and cleaned for Siddhartha's visit. Festive arches were put up to welcome him and houses decorated with flowers and flags. Special instructions were issued that the sick and the old should keep out of the city. Shuddhodhana took every precaution not to expose his son to the sight of human suffering of any kind. The chariot was drawn by four gleaming, white horses. Siddhartha took his seat and Channa, the charioteer, drove him slowly through the city. The people lined up on both sides and cheered their prince. Siddhartha received their greetings with folded hands. "The people are happy," he thought. "The world is indeed a happy place." But he wanted to see more. "Let us go that way, “he told Channa. So Channa turned the chariot into a bylane. There the people were not expecting Siddhartha. There were no welcoming banners and the streets were dusty and crowded. An old man, with bent back came hobbling along, supported by a stick. "Who is that?" exclaimed Siddhartha in surprise. "An old man," replied Channa. Back in the palace, Siddhartha became thoughtful and sad. "Would his beautiful Yashodhara grow old and look like that? Would he too grow old?" When Shuddhodhana heard about it he sent dancers and musicians to divert his son. And for a time they succeeded. But the world outside still worried Siddhartha. He wanted to see more of it. So another visit to the city was arranged. As before, the people received Siddhartha with great enthusiasm. "Surely they are happy," thought the prince. But when he was returning to the palace he saw a sick man who was hardly able to walk. His body was covered with sores and he was groaning with pain. "Why is that man crying?" asked the prince. "He is sick," answered Channa. And Channa explained that everybody got sick, and suffered pain. Slowly the world of sorrow and suffering was being unveiled to the prince's gaze. And on yet another day when he went to the city in his royal chariot, he saw a corpse being carried to the burning ghat. "Where are they taking that man?" Siddhart ha asked. "That man is-dead,' said Channa.”They are taking him to be cremated." And he added, "All who are born must one day die." "Old age, sickness, death? The world is indeed a sad place, "thought the compassionate prince. He was greatly troubled and wanted to know why there was so much sorrow and suffering. The next time while driving along in his chariot he came across an ascetic in yellow robes. The man looked calm and peaceful. "Who is that man?" he asked eagerly. "A sadhu," replied Channa. "He has renounced the world, and is indifferent to sorrow and suffering. He is at peace with the world, quietly searching for the eternal truth." This gave Siddhartha some hope. Siddhartha wanted to be like him. He too decided to renounce the world and become an ascetic. While he was still thinking deeply about these matters, a son was born to him. The baby was named Rahula. While rejoicing at the birth of his son, the restless prince decided not to be diverted from his purpose. He was determined that he should renounce the world without further delay. Siddhartha was then twenty-nine year's old. He woke up in the dead of night while his wife Yashodhara was fast asleep, with one hand lying on Rahula. Siddhartha wanted to take the child into his arms for the last time but was afraid that his wife might wake up. Not even daring to look a second time, he hurried out of the palace. Accompanied by his faithful charioteer, Channa, he went into the forest. He cut off his hair and sent it back to the palace through Channa as a sign of his having become a sadhu and exchanged his princely robes for an ascetic's gown. Then he set forth in search of truth. Siddhartha became a Sakyamuni, a sage among the Sakyas. In his wanderings he reached the famous city of Vaisali where he stayed for some time in the hermitage of the seer Alara Kala ma trying to find the truth about life. He studied different systems of philosophy, but none of, them gave him the answers he was seeking. 'He then came to Rajagriha, the capital of Magadha, the most powerful kingdom of the time. There he joined a famous school run by a great scholar Udraka. Gautama was impressed by Udraka's vast learning but soon felt that mere learning could not lead one to truth. He left the school to continue his search. Would a life of severe penance lead one to truth? Gautama thought he should try this ancient method of the sages, He was joined by five ascetics who asked to become his disciples, with these five disciples he retired into the forest and began a period of penance. He put his body to hardships of many kinds and almost died from fasting, but still found that he was no nearer to the truth. He concluded that severe penance was useless and gave it up. His five disciples took this as a sign of his having gone back to the worldly life and left him. Siddhartha went to a nearby river, Niranjana, and bathed. He was so weak, however, that he was almost carried away by the current. With great difficulty he came ashore. Sujata, a young woman who lived in the neighborhood brought him a bowl of rice boiled in milk. After eating it he felt stronger. Finally, Siddhartha decided that the way to truth lay in deep meditation. He chose a charming spot on the outskirts of Gaya and sat down cross-legged under a peepul tree. "I will not rise from this seat till I understand the truth," he vowed. While thus immersed in meditation it is said that Siddhartha had to face many temptations. The evil spirit. Mara, was afraid that if Siddhartha came to know the truth, he would teach it to the world. Mara would then no longer have any standing. So he first tempted Siddhartha with a vision of his palace, his beautiful wife Yashodhara and little son Rahula. But Siddhartha did not allow himself to be tempted and continued his meditation. Then Mara sent violent storms and whirlwinds to distract him, but the determined sage was not distracted. As a last resort Mara sent his three daughters -Desire, Pleasure, and Passion-to dance before Siddhartha and tempt him. But they too had no effect on him. He continued to be lost in deep meditation. On the forty-ninth day he realized the truth. He became the Buddha -the Enlightened One. The tree under which Siddhartha attained enlightenment was thereafter called the Bodhi tree. Siddhartha, now the Buddha wanted to teach the people the truth he had discovered. He knew that the world was steeped in ignorance and wickedness. "Would it ever listen to him," he wondered. He knew that the task was difficult but his compassion for mankind was so infinite that he did not hesitate. To spread his ideas among the people, however, he needed a band of loyal followers. His first thought was of the five disciples who had left him and were continuing their penance in Sarnath, near Varanasi. So to Samath the compassionate Buddha turned his steps. His former disciples saw him 'approach from a distance. "Here comes Gautama our old teacher," observed one of them. "He who left us for the worldly life," scoffed another. "But he still seems to be an ascetic!" exclaimed a third. "But he shall receive no greeting from us," they all said. But when the Buddha came near the y saw that there was a certain radiance about him. They realized they were in the presence of a great being and sat down to listen to his words. To these five disciples the 'Buddha gave his first sermon. The sermon began with the Buddha advising his disciples to avoid extremes. He said a life of severe penance and mortification was as bad as a life of play and pleasure. People should keep to the middle path, the golden mean. Only then could one have a correct view of life and realize the truth. The truth that the Buddha preached was firstly that the world is full of sorrow and suffering. Secondly this sorrow had a cause. Thirdly to master suffering the cause of it must be removed. Fourthly this can be done by following the noble Eightfold Path. These are what are known as the Four Noble Truths of Buddhism, which were explained by the Buddha in his first sermon at Sarnath. The eightfold path that the Buddha preached enjoins: right views, right aspirations, right speech, right behavior, right living, right effort, right thoughts and right contemplation. This is, the Dhamma, the law of righteousness. The Buddha urged all men to follow this law and be saved from misery. The sermon at Sarnath was only the beginning. For the rest of his life the Buddha travelled the country taking his message of righteousness to the people. Sanskrit was at the time the language of scholars and the nobility. The Buddha preached in Pali, the language of the common people so that everybody would understand him. The Buddha's teachings were very simple and could be easily understood. The Buddha believed in the doctrine of karma according to which he pointed out that man's soul was imperishable and after death would be reborn and come back to life. In each birth man inherits the results of the actions of his previous life. The ultimate goal of life is Nirvana, the escape from the cycle of births and rebirths. This can be attained by a life of virtue and goodness, following the knowledge and Middle Path taught by the Buddha. 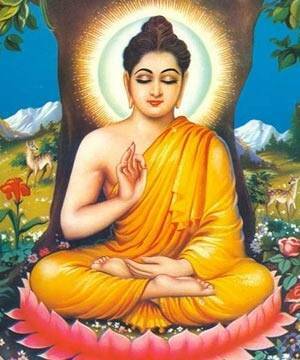 The Buddha was a great prophet of ahimsa, non-violence. To him life was sacred and his followers were enjoined not to kill. This was not to be taken in the narrow literal sense but included any type of violence inflicted by word or deed. The first step was for man to discipline himself. Without proper self-discipline it was impossible to lead a virtuous life. The Buddha says, "He who does not rouse himself when it is time to rise, who though young and strong, is full of sloth, whose will and thought are weak, that lazy and idle man never finds the way to knowledge." The Buddha considered compassion as the highest virtue. Even as a boy his compassion was aroused at the sight of an injured bird. He said, "Just as a mother cares for her only child, so should man feel an all-embracing love for all living beings." Love conquers all, violence.is to be met by non-violence, as also hatred is to be met by love: "Never in this world does hatred cease with hatred, hatred ceases through love." Following the sermon at Saranath, the five former disciple became followers of the Buddha, the first monks or bhikhus of the order of Buddhist monks called the Sangha. In course of time as the Buddha's teachings spread, more people joined the sangha. At that time there lived in Varanasi a wealthy young man named Yasa. Yasa was dissatisfied with life and one day he left home with no particular aim or destination in mind. Fortunately he met the Buddha and was attracted by his divine personality. The Buddha advised him to follow the Noble Path and Yasa was converted. He became a monk, and joined the Sangha. Yasa's father came in search of his son. He too met the Buddha and became his follower. But he did not leave his home and family. He remained a lay disciple. Later the Buddha visited Yasa's house and taught the Noble Path to Yasa's mother and his wife. They became his women lay disciples. The Buddha did not insist on all his followers becoming monks and nuns. He believed that only a few had the temperament and inclination to renounce the world. Most people he expected to live ordinary lives according to the moral code he had taught. They were his lay disciples. The Sangha, the Buddha and his teachings or the Dhamma were to be their guides. The Buddha took great interest in the development of the Sangha. He organized it into a disciplined band of men, trained to explain and spread his teachings to all mankind. The Buddha met many ascetics and won them over to the Middle Path. One of the early converts was the fire worshipping Brahmin priest Kashyapa, afterwards known as Mahakashyapa, who succeeded the Buddha to the headship of the Sangha. With Kashyapa five hundred of his disciples joined the Sangha. Later Kashyapa's two brothers with followings of three hundred and two hundred disciples also joined. The Sangha grew and the fame of the Buddha as a teacher spread all over the country. Soon afterwards, the Buddha visited Rajagriha, the Magadhan capital, accompanied by the monks who were his followers. Bimbisara was then the ruler of Magadha and when he heard of the Buddha’s visit he came with his noble s to pay his respects to the holy man. The Buddha received them kindly and preached the law of righteousness to them. The king and his nobles became his followers. So pleased was the king with the teachings of the Master that he exclaimed, "I have now been blessed with everything. Even more than my kingdom I value these teachings." And he requested the teacher, "Great sage; I shall consider it an honor if you and the reverend monks would come and have a meal at my place. “The Buddha accepted. The Buddha accepted the gift. At Veluvana Park, just on the out skirt s of the city, he founded the first Vihara or monastery. The Viharas were to serve him and his monks as places of contemplation and learning. In those days it was the custom for ascetics, whatever their sect, not to wander about during the rainy season. These three months they spent in some hermitage or temple. This practice was known as going into retreat. Buddhist monks spent their retreats in the Viharas. It was during this visit to Rajagriha that the Buddha converted Sariputra and Moggallana, two of the most famous monks of the Sangha. Before they became followers of the Buddha, Sariputra and Moggallana were wandering ascetics. They had been friends from childhood and had renounced the world in search of the truth. They had decided that the one who first came to know the truth would tell it to the other. One day, Sariputra in his wanderings came across Assaji, one of the first five disciples of the Master. Sariputra was impressed by Assaji's noble bearing. He asked, "Who is your teacher, brother? Whose Dhamma do you follow?" "I follow the sage of the Sakyas," answered Assaji. Assaji thereupon explained to him the Dhamma that the Buddha preached. "This is the truth that 1 have been searching for,"exclaimed Sariputra. He hurried to tell his friend Moggallana. Together they went to the Buddha and were received into the Sangha. Within a few years of his Enlightenment, the Buddha's fame reached his old father also. Shuddhodhana was still unhappy about his son's renunciation. He wanted him to come to Kapilavastu, even it for a short visit. Perhaps he hoped that his only son might return and take up his rightful place as leader of the Sakya people. So when Shuddhodhana heard that the Buddha was preaching at Rajagriha he sent one of his trusted ministers with a thousand men to invite him to Kapilavastu. The minister and his men arrived when the Buddha was preaching to a large gathering of people. They joined the crowd to hear the Master. They were so carried away with the sermon that they were converted at once. They renounced the world and became monks. Becoming totally detached from the world, they forgot the purpose of their visit. The invitation was not conveyed to the sage. Then Shuddhodhana sent Kaludayin, the childhood friend and playmate of Siddhartha .After hearing the Master preach Kaludayin also became a monk but he did not forget his promise to the king. One day while the Buddha was resting in a park, Kaludayin said quietly, “Lord your father, aunt Prajapati, and 'wife Yashodhara are anxious to see you. The king has sent me here specially to request you to come." The BUddha remembered the relations he had left and wished to see them, if only to show them the path of righteousness he had discovered. He started off for Kapilavastu. Kaludayin went ahead to inform Shuddhodhana about the visit. Shuddhodhana came out of his palace with his ministers and nobles to welcome his son. When the king saw the Buddha, he was struck by his radiance and dignity. Embracing his son he said. "I grieve no more. You have found the path to save all mankind." Having chosen to become homeless monks, the Buddha and his disciples would not stay in the palace. King Shuddhodhana arranged for them to live in Nigrodha Park, not far from the city. Many people came to Nigrodha Park to pay their respects to the Buddha. At first the Sakya nobles refused to come; they said the Buddha had disgraced his people by becoming a wandering hermit. But when ultimately they did come and listened to him, they were so moved by his words that many of them renounced the world and followed the Buddha. The next morning the Buddha, as customary among monks, took his bowl and set out to beg. The news reached Shuddhodhana. "What! My son would beg in the streets of Kapilavastu? "he mourned. Shuddhodhana rushed out to his son. "Why do you disgrace me thus?" he asked. "I can easily give you and your monk’s food. Do not go begging. ""This is the custom among my people," replied the Buddha. "How can that be, my son?" asked Shuddhodhana. "You are descended from kings!" "No," the Buddha said, "I am a monk. Monks have no worldly descent." Without another word the king conducted the Buddha and his monks to the palace. The royal family came out to greet him. Among them was his aunt, Prajapati, and other ladies of the palace. But Yashodhara was not there. She refused to come saying, "If I am deserving of any regard he will come to see me." Shuddhodhana told the Buddha, "The seven years you were away, Yashodhara led a life of renunciation. She cut off her hair and dressed in yellow robes. Indeed, she has lived like an ascetic." The Buddha at once went to Yashodhara's room. Yashodhara fell at his feet and wept. The Buddha praised her devotion and gave her his blessings. The Buddha's son Rahula was then seven years old. The boy had no knowledge of his father and had been under the impression that he had no father other than Shuddhodhana. On the seventh day after the Buddha’s arrival in Kapilavastu, Yashodhara dressed Rahul a as a prince and sent him to his father to ask for his inheritance. When the boy approached asking for his inheritance the Buddha turned to his disciple Sariputra and said, "Admit him into the Sangha." From Kapilavastu the Buddha again set out to preach his new knowledge. Wherever he went a big crowd gathered to listen to his sermons. Both high and low caste found refuge in the Buddha. There is the story of Prasenajit, the powerful ruler of Kosala. Once, Prasenajit was making preparations for a grand animal sacrifice. The Buddha went to the hall of sacrifice and pleaded for the animals. King Prasenajit listened to him and was converted to the path of ahimsa shown by the Master. Another famous convert was Angulimala, a notorious outlaw who wore a necklace of human fingers taken from the hands of his victims! To this violent dacoit went the compassionate Buddha, unarmed and unattended. The dacoit was impressed by the courage of this man of ahimsa and was converted. He became a prominent member of the Sangha. Vishakha was a famous woman convert. She was the daughter of Dhananjava, a rich banker of Shravasti, the capital city of Kosala. As a girl she had become a follower of the Buddha along with her father and his entire household. When she grew up, Vishakha was married to Purnavarthana, the son of another rich banker, Migara, also of Shravasti. But Migara would not agree. "Don't you know that he has made many young men renounce the world and become monks. Indeed he has broken many homes and now you want him to come to our home." "That is a rumour his enemies have spread," Vishakha pleaded. "I know that he will bring only peace and happiness to the household." "Father, what harm is there if he comes here?" her husband interrupted in support of his wife. "We will only be showing him the ordinary courtesy due to a holy man!" Finally Migara agreed. Vishakha invited the Buddha to the house. Vishakha was convinced that once her father-in-law heard the Buddha speak, he would be converted. So she arranged things in such a way that Migara heard the Buddha when he spoke to the members of the family. As expected, Migara was so moved by the words of the compassionate Buddha that he was converted. Vishakha never missed a sermon given by the Master in Shravasti. Once, on entering the hall where the Buddha was preaching, she removed her jeweled headpiece and kept it aside. She forgot about the jewel and went' home after the sermon without it. The venerable monk Ananda, a disciple of the Buddha found the headpiece after everybody had left. He guessed that it belonged to Vishakha and sent it to her through a servant. But Vishakha would not take it back. She donated it 'to the Sangha. The ornament was so expensive that there was nobody in Shravasti rich enough to buy it. So Vishakha came forward to buy it herself. With the money she built a Vihara for the Buddha and his disciples and called it the Eastern Park. It became the favorite abode of the Buddha whenever he came to Shravasti. Ananthapindika was a rich merchant of Shravasti. His real name was Sudatta but because of his many deeds of charity he had been given the title Ananthapindika, meaning the giver of alms to the unprotected. Once, on a visit to Rajagriha on business, he stayed with his sister. He saw that elaborate preparations were being made to welcome somebody. Ananthapindika thought that it must be the Magadha king Bimbisara himself that his brother-in-law was expecting. But his brother-in-law said, "Lord Buddha is coming with his monks." "Where is he?" enquired Ananthapindika eagerly. "Just now he is in Sitavana," said his brother-in-law, indicating a park not far from the city. Ananthapindika wanted to go at once and meet the Buddha. But his brother-in-law stopped him. "It is too late. You can go early in the morn ing." Ananthapindika hardly slept that night. He got up thrice thinking it was already morning and before sunrise he finally rose and set off for the park. He reached Sitavana even before the Buddha had woken. The Buddha received him kindly and advised him to follow the Dhamma. Ananthapindika was greatly impressed by the Buddha and was ready to leave his responsibilities as a householder and become a monk. "I want to renounce all my riches and become a monk in the Sangha," he said. "There is nothing wrong in being rich," said the Buddha. "What is wrong is undue attachment to riches. Moreover, one must be willing to use one's wealth for the common good." "Many depend on me for their living," said Ananthapindika. "Then how can you renounce the world and let them go hungry?" asked the Buddha. "It is not essential for one to give up the world to follow the path of righteousness. The life you are leading is a good one. Why renounce it?" Ananthapindika rejoiced at the words of the sage. He offered to build a monastery at Shravasti for the monks' retreat during the rainy season. The Buddha accepted. Ananthapindika took Sariputra, a prominent disciple of the Buddha, to help him select a good site for the monastery. They found a suitable place, not far from the city which was quiet for meditation and prayer. But now a problem arose because prince Jeta, who owned it, refused to sell it. When Ananthapindika insisted, the prince tried to put him off saying, "You can buy it only if you can cover 'it with gold." Ananthapindika at once brought large wagons laden with gold coins and began to cover the place with them. This was totally unexpected. Prince Jeta now said that he had been only joking. Since they could not agree, the matter was referred to a judge who declared, "Perhaps the offer was made in jest but as the other party accepted it, it is as good as a deal." Thus prince Jeta unwittingly had to part with the site. But when he came to know that a monastery for Buddhist monks was to be built there, he was very happy and wanted to contribute towards it . He took only half of the gold, saying, "The land is yours, but the trees are mine. I will offer my share to the great teacher." The monastery built there came to be known as the Jetavana Vihara. It became one of the favorite retreats of the Master and many of his discourses were given there. King Prasenajit accompanied by his nobles came here several times to pay homage to the Teacher of Righteousness. The Buddha advised him on many matters. "Give me some water, sister, I wish to drink," requested Ananda. "Don't you know that I am a Chandala?" she asked in surprise. "I do not ask, sister, for your family or caste. If you have any water left, give some to me. I wish to drink, “was all that Ananda replied. The Buddha did not recognize the division of society into different castes. The practice of untouchability in particular he considered an insult to humanity. That was what made his disciple Ananda accept water from an untouchable Chandala girl. Many stories are told about the Buddha. One such tells of him in the role of peace-maker. His kinsmen, the Sakyas and the Kholiyas were at the point of war over the waters of the river Rohni. The two armies had assembled on the battlefield, when between them appeared the compassionate Buddha in his yellow robes. "Tell" me whether these waters are valuable in themselves or for the benefit they give your peoples," the Buddha asked gently. Both kings replied that they were only useful in as much as they benefited the people. "But if you wage war many of your people will be slain," said the Buddha. "Therefore you must decide whether you value the waters more than the people for whose use you want them." The two parties compromised and war was averted. Once, while the Buddha was on his da ily round for alms, a foolish young man abused him without reason. The Master remained calm and asked him, "Son, if a man declines to accept a gift made to him, to whom would it belong?" "In that case it would belong to the man who offered it," answered the young man. "You have abused me and I decline to accept the abuse, “said the Buddha. "As the echo belongs to the sound and the shadow to the substance, evil overtakes the evil doer." At times to make his point clear he spoke in parables. One such parable was the story of a king of Varanasi. The king of Varanasi was a powerful monarch. Once seeing the weakness of the smaller neighboring kingdom of Kosala, he attacked it. The king and queen fled and took refuge with a potter in Varanasi where their son, Dighavu, was born. As Dighavu grew up he acquired many skills and soon was given employment in the royal palace. He rose swiftly to a position of trust and the king became very fond of him. One day on a hunting trip the king got separated from his retinue and only Dighavu was left with him. The king was worn out and fell asleep with his head on Dighavu's lap. This was the chance Dighavu had been waiting for. He drew his sword out of its sheath and said, "You killed my father and mother. Now it is your turn!" But suddenly the words of his father carne to his mind. Dighavu put his sword back and took the trembling king back to the palace. This great act of forgiveness moved the king of Varanasi, He repented, returned to Dighavu all that he had taken from his father and also gave him his own daughter in marriage. The Buddha exhorted the people to be forgiving like Dighavu. The Buddha compared the Middle Path to a well-tuned harp. When the harp strings are stretched too much or too little it is not fit to play upon. For the best results the strings must be stretched with precise moderation. So too one must be even tempered, whether it is in action or inaction. On another occasion the Buddha said to one of his disciples who came to ask him about Nirvana, "See how boys and girls play with sand castles. As long as' they are interested in the game, they delight in the castles and treasure them." "So they do, Lord," said the disciple. "But when they have finished with them, do they not knock them down, break them up and scatter them." "So also men treasure this bodily existence as long as the desire for life lasts. When the desire is destroyed, the bodily existence is broken up and scattered. The soul then attains Nirvana." Once the Buddha was on his way to Shravasti when a woman, Kisa Gautami, brought to him a dead child. The poor woman had been told that the Buddha would be able to revive him by his divine powers. Kisa Gautami was a poor girl, who had married a rich merchant of Shravasti. She had only one son whom she loved greatly. One day, while the boy was playing in the garden, he was bitten by a poisonous snake. He died at once and Gautami was inconsolable. She carried the dead, cold body around, asking everyone for medicine that would revive him. "Poor Gautami, she has lost her senses!" people began saying. Though everyone felt very sorry for her no one could help. At last an old traveler suggested, "Why not seek the help of the Buddha. He is a holy man who is said to cure all sorrow and suffering." Gautami ran to meet the Buddha, still holding the dead child to her bosom. She fell at his feet, saying, “Lord have pity on me! Give me medicine that will revive my son." Seeing her distress the Buddha answered gently, "Bring me a handful of mustard seed." Gautam i went from house to house ' in search of the handful of mustard seed. But in each house , in every family, in answer to her query, "Has a son or daughter, a father or mother, a friend or relative died in this household?" the answer was always the same, "Alas, the living are few but the dead are many! We have lost many a dear one." Gautami went to every house in the city without finding one in which there had been no death. At last she realized what the Buddha had been trying to tell her. "Death is common to all," she admitted at last. She buried her son and went back to the compassionate Buddha who advised her, "Grieve no more. Nothing lasts forever." Devadatta, the Buddha's cousin was a constant companion of Siddhartha before he renounced the world. Even then Devadatta was jealous of Siddhartha and always tried to put him in trouble. Out of spite he once killed a white elephant which the young prince was especially fond of. During the Buddha’s first visit to Kapilavastu after enlightenment, along with many other Sakya nobles, Devadatta too joined the Sangha. The Buddha was kind and considerate to his old playmate and showed him special respect. Soon Devadatta rose to a position of prominence in the Sangha. The Budana was the undisputed leader of the Sangha, and Devadatta grew envious of him. He wanted to become the leader himself. First he approached the Buddha with the suggestion, "Lord,you are old now and need rest : Why don't you retire and leave it to me to manage the Sangha?" "I shall lead the Sangha as long as I live," replied the Buddha. He clearly saw the motive behind Devadatta's suggestion. Disappointed in his attempt to gain the leadership of the Sangha, Devadatta wanted to split it. Eight years before the death of the Buddha he started a rival organization with a few personal friends and dependant s. He even succeeded in securing the support of five hundred monks of the Sangha at Rajagriha. The Buddha sent Sariputra and Moggallana to talk to the defecting monks. Seeing them Devadatta thought that the two foremost disciples of the Buddha had also left the Master to join him! He invited them to address the defectors. Sariputra and Moggallana reasoned with the five hundred, and made them see the foolishness of their action. They persuaded them to leave the wrong path shown by Devadatta and return to the path of righteousness. This made Devadatta very angry. His hatred for the Buddha grew and he decided to kill him. For this he enlisted the support of Ajatasnatru, the son of King Bimbisara of Magadha. Bimbisara was a loyal follower of the Buddha. As long as he lived Devadatta knew that he would not be able to get the upper hand in Magadha. So he told Ajatashatru, "Your father is not very old. Do you think you have any hope of becoming king?" "Why then don't you kill your father and become king," suggested Devadatta. Prince Ajatashatru was easily persuaded and started plotting to kill his father. One day while on his way to his father's chamber with a dagger he was caught and brought before the king. But Bimbisara was in no mind to punish his son. He had become a faithful follower of the Buddha and disliked all violence. And, in the true spirit of the teachings of the Master, he abdicated and handed over the kingdom to Ajatashatru. Bimbisara renounced the world and became a monk. But later instigated by Devadatta who insisted that Bimbisara would try to recover his throne, Ajatashatru murdered his father. After Ajatashatru became king, Devadatta became prominent in Rajagriha. When he came to know that the Buddha was on his way there to spend the rainy season in his monastery, he conspired to kill him. Devadatta selected a band of the best archers from Ajatashatru's army and placed them at different points along the route the Buddha was expected to take. But when the Buddha came in sight, the archers were so awed by his divine appearance that they fell at his feet and connfessed that they were there to kill him. The compassionate Buddha forgave them, and sent them back to Devadatta. The failure of the archers made Devadatta all the more angry. He watched the movements of the Master carefully, hoping to get another chance to put his plan in action. One day, while the Buddha was meditating at the foot of a hill, known as Vulture Peak, Devadatta went up to the top and hurled a huge stone at him. The stone rolled down with tremendous force, but on its way it hit a hard rock and broke into many pieces. The next day the Buddha came into the city to beg for alms as was his custom. When the keepers saw him they let loose Nalagiri. The raging elephant, trunk raised, charged at the Buddha angrily. Ananda, the faithful disciple, seeing the elephant rushing forward, stood in front. "Let the elephant kill me first," he said. But by that time the elephant had become calm. One look from the Lord, full of loving kindness, was enough to pacify the fierce Nalagiri. Nalagiri put down his trunk and stood before the Lord, like an obedient child. The Buddha spoke kindly to him and blessed him. The elephant knelt at the Buddha's feet. With his trunk he took the dust of the Lord's feet and scattered it over his own head. Then he went back to his stable. Soon afterwards Devadatta felI ill. He repented and wanted to seek the Buddha's forgiveness. Helped by some kindly monks he was on his way to the Buddha, but before he could reach the Master he died with a prayer to the Buddha on his lips. The Buddha was getting old and he needed somebody to look after him. The monks vied with one another to serve the Master. "I shall attend on you, Master," offered Sariputra. "No, I shall be the one to do that," said Moggallana. Buddha chose to help him in his old age. Ananda became the favorite disciple of the Buddha and attended on him for more than twenty years. Though nearing eighty years the compassionate Buddha continued travelling from place to place to preach. The Buddha spent his last retreat near Vaishali, the capital of the Licchavi republic. The Buddha lived there in a mango grove which belonged to a dancing girl named Ambapali. Hearing that the great Sakyan sage was camping in her grove Ambapali came to pay her respects. She invited the sage and his monks for dinner to her house. It so happened th at on the same day the proud Licchavi nobles, the rulers of Vaishali, also came to pay their respects to the Buddha. They too asked him and his companions for a meal. But the Buddha declined their invitation, “I have already accepted to go to Ambapali's house," he said. "We have been rejected in preference to a mere dancing girl" the noble s complained. But the Buddha paid no attention. Great and small were equal in his eyes. He felt that the dancing girl was more in need of his understanding and compassion than, the great Licchavi nobles. After dinner, the Buddha retired to a nearby village. Here he became dangerously ill. Ananda thought that he was going to die. He begged the Buddha not to leave him and cried like a child, "Who will guide us when you are gone?" "Do not grieve Ananda. My teachings and the Sangha will be your guide," the Buddha consoled him. The Buddha, however, recovered from this illness. Now he became more anxious than ever to preach. He was concerned about his followers, the monks who would be soon without his living presence. He called the Vaishali monks together and gave them his final message. "Each should be a refuge unto himself. Each must concentrate on self-discipline. Only through self-discipline can one know the truth, and can one lead a virtuous life." From Vaishali the Buddha went in stages to Kushinagara, the country of the Mallas, on the way, at Pava he accepted the hospitality of a blacksmith named Chunda. The food served by Chunda was perhaps too rich for the weakened state of the Buddha's health, but rather than offend his host, the Buddha ate it and consequently fell very sick. But he proceeded to Kushinagara all the same. Here he asked Ananda to spread a clean sheet in the shade of two Sal trees. There he rested for some time. Afterwards he met 'the Malia nobles who had come to pay their respects to the learned teacher. After they left he rested. Just then an ascetic, Subbaddha arrived and wanted to see him. "The Master is tired and is resting," Ananda said. The Buddha overheard him and insisted on seeing the ascetic. Even on his death-bed the Buddha did not refuse his guidance to the needy. The ascetic listened to the Buddha's teachings and joined the Sangha. Subbaddha thus was the last disciple admitted to the community of monks by the Buddha. The Buddha's condition deteriorated. The monks from the neighbourhood gathered at his bedside. To them the Buddha gave his last message, "To die is natural. Therefore st rive to be good ." And so the great teacher passed away and attained Nirvana. The Buddha's teachings did not die with him. Even before his death they had become a major force within the country. And today, more than two thousand five hundred years after the death of the Buddha the wheel depicted on our national flag is the wheel of righteousness which is a symbol of the Buddha's teachings to the people. I take refuge in the Order.